The Wife of President Muhammadu Buhari, Aisha, on Saturday led the All Progressive Congress (APC) Women and Youths Presidential Campaign Team on a solidarity walk for the re-election of her husband. 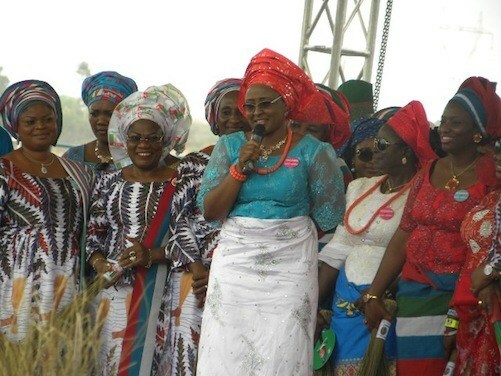 Mrs Buhari was represented by the wife of the Vice-President, Dolapo Osinbajo, who led the team from the Unity Fountain to Eagle Square in Abuja. The solidarity walk was attended by the FCT Minister Musa Bello, Minister of Sports, Solomon Dalung, former Military Governor of Lagos State Buba Marwa, and former Inspector General of Police Suleiman Abba. Others were the Senior Special Assistant to the President, Dr Hajo Sani, and the wives Ogun, Nasarawa, Borno and Ondo states governors, Olufunsho Amosun, Mairo Al-Makura, Nana Shettima and Betty Akeredolu respectively. The APC supporters who converged on the venue were mostly women and youths, who chanted solidarity songs for the APC. They made various displays expressing their support for the re-election of the President on Feb.16.